Born and raised in Bruges, I met Peter, my future husband when I was 16 and followed him to Brussels. 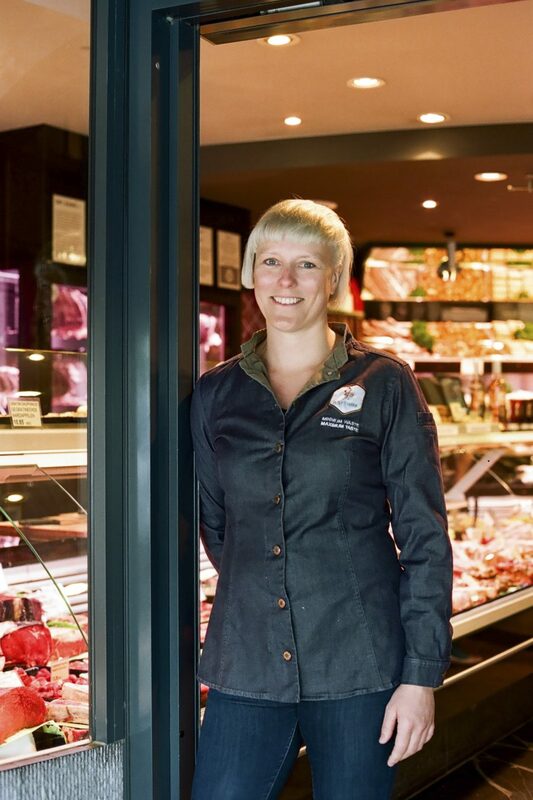 We started our own butchery Peter & Sabine a few years later and are happy to celebrate our 20th anniversary this year. I’m a butcher’s wife and Peter’s biggest fan, but I also continue my search in excelling in something myself. Incidentally, this is how Chateau Lacrou came to be: an Ardennes-based country house that we renovated into a holiday home for groups of up to 22 people. I also enjoy writing – sometimes poetry, sometimes about my frustrations. I’m finding the meat industry and Brussels’ politics to be of great inspiration these days. Almost everyone in my family is self-made. My parents grew vegetables, and my holidays were very much determined by the seasons of leeks, salads and tomatoes. My childhood memories are filled with the very particular smell of a tomato plant, the sound of rain on a hangar, the touch of naked feet playing in the mud. And the ambiance of a group of people working together to catch the daily deadline of delivering a truck full of fresh leeks or salads to be auctioned off. Peter and I are firm believers that you can achieve any goal you set out ahead of you as long you work hard. We do what we know best. All of our achievements over the years are a result of our mastering of a very specific set of skills – chopping up meat and creating the best possible recipes with it. Keep it basic and simple; sell what you would love to buy yourself. Our knowledge of meat and food in general are always recognised by our clients. How we can be dedicated to our individual dreams while remaining completely loyal to each other. Our slogan is, “Minimum waste, maximum taste.” We try not to give in to an easy way out, while would be simply buying and reselling products. But that would involve no creativity, which is why we continue to buy our meat in carcase form. We cut up the beef, pork, veal and lamb in our own atelier and prepare most of the charcuterie ourselves. That means hard work, but it’s very rewarding when clients recognise our craft. Somewhere along the line, it’s all become a battle between the butcher trade and the meat industry – but we’re convinced that butchers can win the fight if we succeed in convincing the media and public of our integrity. My children are Ketjes. I have three teenagers who call Brussels their home. They are the city. A Ketje is someone who doesn’t see the restrictions the city can impose on one, rather only the opportunities. There’s plenty of young talent in Brussels, and it’s not limited by language or origin. People speak the language dependent on who they are speaking to. We’re a small country, and so we’re highly flexible. Sometimes we even adapt too easily. We could afford to be a little prouder of what we’re capable of. But that’s who we are: modest and always looking forward to the next opportunity, without counting too much on help from others. Arno would have to be one of them. Passing him on the street, he’s just an old man with a torn jacket. Yet once on stage, he’s all rock and roll. And if he were to ever start a religion – let’s say Arnoïsme – I would be a loyal follower. I admire the stubbornness with which he refuses to give in to the system. Secondly, Marion Hänsel, a filmmaker who incidentally lives close to us. A very independent person – I admire women who live their lives without compromise. A fearless woman who creates her own universe through her films. Finally, Assita Kanko – I like what she stands for. She recently stepped out of politics to support other women seeking to enter politics. A great role model. If I were to ever go into politics myself, I would definitely reach out to her. Could I create my own restaurant? There’s an old building on Rue du Marché aux Porcs/Varkensmarkt in Brussels, Le Cheval Marin. It’s currently being restored, but it went largely abandoned for a long time. I used to dream about the place and its opportunities – I would have called it The Butcher’s Wife. It would have a grand open hall surrounded by a terrace, like a theatre. I would serve homebrewed beer and freshly baked bread – complete with real butter and charcuterie – and champagne and giant shrimps. There would be concerts and stand-up comedy every now and then. Sometimes a poet would jump on the bar and share their writing. People of all creeds would come to talk and listen to each other or sing along. People don’t sing enough. Troubadours could save the world. Perhaps this is more of a pub than a restaurant. The Ardennes are where I go to find some inner peace. Located on the banks of the Semois river, Chateau Lacrou is our lovely safe haven, but because of the grandness of the property we need to share it with others. In spring when the river grass blooms, you can rent a kayak and float down the river, passing miles of protected nature. It can get quite crowded on the weekends, but there’s not a soul in sight during in the week. We would go to Chez l’Ami Pierre in Alle-Sur-Semois and take a grand tour to Bohan, where we would pick up rented scooters. After a quick drive further down the road, we would enjoy a picknick on the riverbanks, in a small spot that almost nobody knows about. And to end, journeying back to Lacrou where we would enjoy aperitives in the hot tub while enjoying the sunset and a fine selection of dry aged meats is cooking on an open fire. Tell us about the first time you discovered BK sauces? Must have been the Ketjep in a restaurant. I remember saying how original the name was. And if I remember correct, BK’s Sylvain had already contacted Peter by that time to see if we were interested in distributing his product. Sylvain seemed quite content that his local butcher would sell his product – and we were proud to see him grow as an entrepreneur. Belgians are down to earth and robust. We think small but create big, without even recognising the grandness of our ability. Never satisfied, we keep striving for perfection. Just as it is rare for us to compliment someone, we don’t take them that well either. Instead of saying thanks, we think, “Yes, but…” – and the but is always the next step on the stairway to eternal recognition.